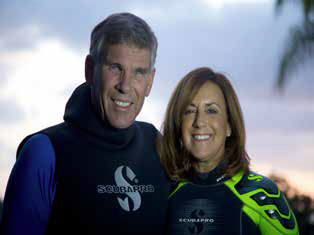 Howard and Michele Hall are wildlife filmmakers who specialize in marine wildlife films. 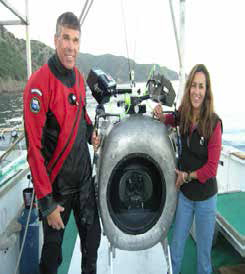 Working as a team, Howard and Michele have produced and directed many television films including a National Geographic Special, three episodes of the PBS series Nature, and the five-hour PBS series Secrets of the Ocean Realm. Their television work has resulted in seven Emmy Awards. 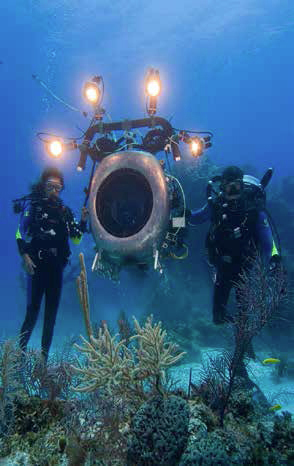 In 1994, Howard directed the first-ever underwater IMAX 3D feature, Into the Deep, and in 1998, he directed and Michele produced the IMAX film Island of the Sharks. The Hall’s returned to the IMAX 3D format in 2005 when Michele produced and Howard directed the Warner Bros./ IMAX feature Deep Sea 3D; the award-winning sequel Under the Sea 3D followed in 2009.Of the five highest grossing 3D films produced by IMAX Corporation, two were directed by Howard. Beneath the Sea, then inducted into the International Scuba Diving Hall of Fame. In 2013, the Halls received the International Wildlife Film Festival’s Lifetime Achievement Award for Marine Conservation & Media. Beneath the Sea is proud to recognize The Halls’ many years visionary leadership by recognizing them as Pioneers in the dive industry adding their vision and determination to the sport of diving.